Big sigh of relief, everybody. 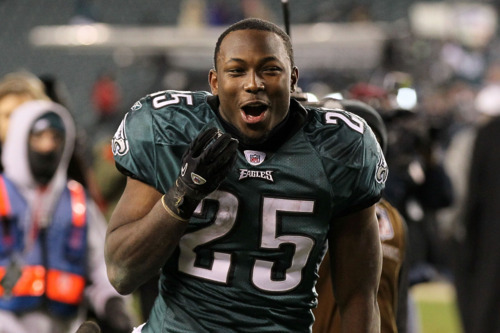 LeSean McCoy signed a long term contract extension with the Eagles yesterday: five years, $45 million, and $21 million guaranteed. Rather than be a free agent next season, McCoy is locked up through age 29 — even if some of the money toward the back is likely to be restructured at best. It’s a day to celebrate the Eagles keeping yet another valuable contributor — and not just retaining Evan Mathis, or making Trent Cole happy. This is a vitally important move on the field and in the locker room. DeSean Jackson’s situation last year was no fun at all, and it’s good to see that the front office learned from their mistakes and locked up McCoy before things got ugly. So much for “on the hot seat.” In what was apparently an unconventional move for him, Reid participated in the McCoy negotiations. There’s only one conclusion you can draw from such news — that Reid has actually consolidated power over Roseman this offseason, rather than relinquishing it. It’s a common refrain that players like to play for Reid and think he’s on their side. Asante Samuel was the most recent example of this phenomenon: bashing the front office (Roseman and Joe Banner), while reserving only sweet words for his coach. It’s easy to break that down as players falling too easily into a good cop-bad cop situation, where Reid is just as cold-hearted behind the scenes but maintains a happy demeanor in the locker room. Unless it’s actually true. Maybe Reid really does care more about his players, would rather give up a few million extra in contract talks than see things get acrimonious. Maybe he doesn’t need to feel like he “won” the negotiations, as Rosenhaus described Roseman yesterday. One might say that’s weakness, and it is to a degree. But after all the drama the Eagles have gone through in the last year, putting free agents ahead of their own stars and reaping the rewards for that, it’s a weakness they could probably use a little bit more of. Tagged with Philadelphia Eagles, NFL, Andy Reid, LeSean McCoy, Contract, Contract Extension, Salary, Drew Rosenhaus, Howie Roseman, Joe Banner, Front Office, DeSean Jackson, Asante Samuel. May 18, 2012 by Brian Solomon.